Volvo Trucks is rolling out another electric truck in Europe as it continues to push into alternative fuel vehicle development. The Swedish company, not related to the automaker with the same name, said it will launch the Volvo FE Electric, a garbage truck with a body developed with Faun, a European refuse equipment builder. The new vehicle will start collecting trash early next year in Hamburg, Germany’s second-largest city. Earlier this year Volvo premiered its FL Electric truck lineup for what it called “urban distribution.” The company said the vehicle was entering operations in Gothenburg, Sweden, the city where Volvo is based. Volvo said it is looking at introducing electric trucks in the U.S. but hasn’t provided any details or outlined a timeframe. The company is pushing into the technology in Europe because it believes electric trucks have advantages in dense, urban areas. They produce less air and noise pollution. “This opens the door to new forms of cooperation with cities that target to improve air quality, reduce traffic noise and cut congestion during peak hours,” said Claes Nilsson, President Volvo Trucks. Commercial operations can be carried out quietly and without tailpipe exhaust emissions early in the morning or late at night, Nilsson said. The Volvo FE Electric will have a gross vehicle weight of about 60,000 pounds and can also be used for distribution and other applications. It’s powered by two electric motors and will have a range of up to 125 miles. The smaller Volvo FL Electric will have a range of up to 187 miles. Most of the major truck builders are pushing into electric vehicle technology, either with battery-electric trucks or hydrogen fuel cell offerings. Electric trucks will have the most utility for certain uses, such as local package delivery, short-haul operations and transporting goods on a 200- to 300-mile route with charging infrastructure at each end, according to a recent report from the North American Council for Freight Efficiency, or NACFE. 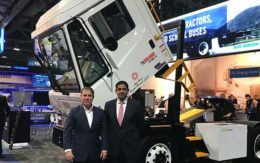 At the Waste Expo in Las Vegas earlier this year, Peterbilt displayed an electric garbage truck that can drive 80 miles and pick up 900 cans on a single charge. 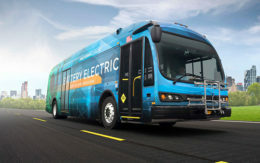 Navistar is rolling out an electric school bus and is working on a truck with its partner, Volkswagen Truck & Bus. Volvo already faces competition in the urban delivery market from Daimler Trucks’ new electric truck unit, E-Fuso. Startups, including Nikola Motor, Tesla Inc. and Thor Trucks, also are trying to break into the market.